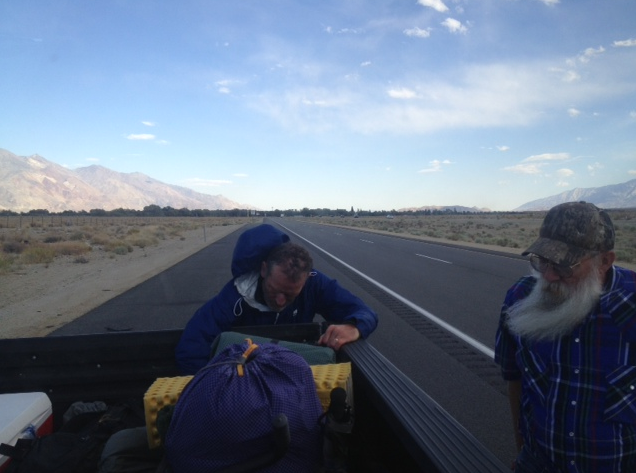 Day 53: From Lone Pine to Onion Valley… And Back to Bishop? By 7:30, my stomach was growing very hungry, my body was growing restless, and still, there was no sign from Muk Muk. I texted her and asked if they were ready and soon after met them in the lobby and headed across the street. The waitresses were very familiar with UB and Muk Muk by now because they had eaten there so many times in the past few days! UB set up his video camera and started filming us, much to my chagrin. Muk Muk loved her time in Lone Pine so much that she wanted to stay there and start a family with the three of us! The owner of the place even told us that he was tired of running it and wanted to sell it. He suggested we could take it over, with Muk Muk acting as the hostess. He asked UB if he was protecting us out in the woods and he replied that Muk Muk was the one who wore the pants. As scared of the dark and the animals (and even going to the bathroom outside) as he was, UB definitely wasn’t the one to take care of us, as nice as that sounded! The owner ended up giving him a super-strong marijuana joint that he said would knock him out if he tried hiking after smoking it! UB thankfully tucked it into his coat pocket. I headed over to the post office, wanting to be first in line to finally get my resupply box and package that Amanda had sent me. She was worried that the contents would be spoiled by now. I was still nervous about interacting with the post lady! Fortunately, a visiting postal worker from Mammoth was there on this day and he retrieved my packages with no problem! (Even the one that Amanda had sent to “General Delivery” without my name on the address!) He even said he would see me when I got to Mammoth in about a week! I made the trip back to my room with heavy arms and began the sorting process! I had to work quickly! I was dismayed to find no socks in my resupply box. I had asked for them in my Kennedy Meadows box and was disappointed when they were none in there, but now it was becoming a big problem! Once I sorted through everything, I needed to go to the outfitter and see if they had any toe socks, and then go to the pharmacy to pick up my prescription for flagyl, as well as some probiotics. The outfitter had only one pair of toe socks. They weren’t in any packaging and didn’t have a size on them, but would have to do. The clerk told me that I could check with the hostel to see about getting a ride to the trail. I returned to the pharmacy to get my prescription and randomly chose a box of probiotics from the shelf. Then, I headed back to my room to do my final packing and begin my search for a ride. No one was at the hostel. I finally called the number and the lady cleaning the rooms said she would be down in a half an hour. She gave me the number of a man who I could try calling in the meantime, but there was no answer. I didn’t have any more luck when she returned. She just pointed me to the bulletin board where there were three options for getting a ride back to the trail. The first one cost $210! I said no thank you and before I could hang up, the guy warned me that the others didn’t have insurance, which would have big implications for me if they got into an accident on the way up the mountain. I finally found a man that would be ready to take me in a little over an hour for $55. I headed back to the ice cream shop for a breakfast sandwich and coffee and told Muk Muk and UB that I had some pecan square crumbles for them from Amanda. They were just checking out and getting ready for their own ride. Muk Muk continued to blog and UB worked on editing his videos and soon, it was time to separate once again. UB asked if I wanted to go back with them and hike Whitney again. I thought about it for a couple of seconds, as it would be nice to have some company on the trail, but I had already hiked that section, and Dust Bunny was right- the coldness of Mt. Whitney was too much for the body to handle twice. I needed to stick to my own path. He started to sing new words to “He’s So Vain”- “She’s so fast.. We’re prob-ly never gonna catch her…”. He said they needed a way to slow me down. I told him I’m already hurt (my calf muscle was still causing pain from climbing Whitney) and my stomach was also hurt! “You need something more!” he said. Muk Muk said that they would probably see me in Oregon. “Oregon?! That’s 1,000 miles away!”. We hugged each other goodbye several times and I told UB to take it easy on his knee. I met my ride at the hotel and then I was on my way to the trail head. Ominous dark clouds overtook the skies as we drove. I could see the rain falling on the mountains. My driver said I was headed right into that. Then, he noticed that there was a clear patch that happened to be right over the part of the mountains that I would be climbing! Maybe I was going to get lucky after all! We wound up the mountain and when we arrived back at the parking lot, he let me out just as cold drops of rain started to fall. I had to take everything out of my pack to to find my raingear. It turned out that I hadn’t gotten so lucky! The rain fell harder and the air grew colder. 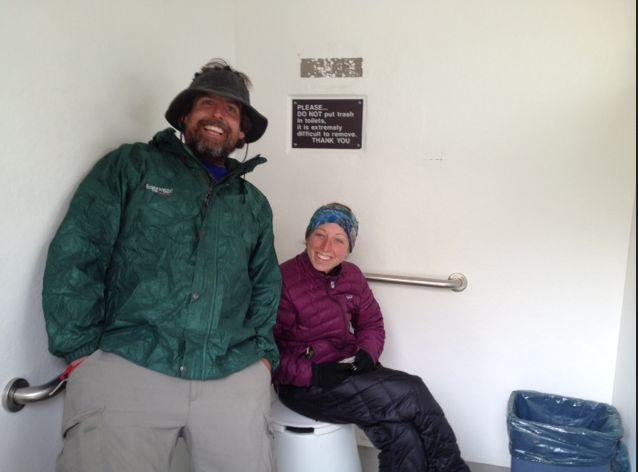 I used the toilet in the outhouse and then started the climb back up Kearsarge. A couple of dayhikers were headed down. “Heading right into it, huh?”. I stopped underneath a tree to put my camera and phone in a ziplock bag and make sure things weren’t falling out my pack that was too full to close. My hands were so cold!! I continued on and began wondering if this was such a good idea. I was climbing up to 12,000 feet and already it was turning to snow and hail. I looked back down and saw an RV below. Maybe they would let me sit in there until the storm passed? Or at least I could hunker down in the outhouse. Maybe I could even do some journaling in there while I waited for the storm to pass! I turned around and headed back down. When I reached the outhouses, I discovered that I was not the only one who had this idea! Delaware Dave and Craig were also hanging out there, waiting for the storm to pass before they started their climbs. I abandoned my journaling plan and stood with the others so I wouldn’t be hogging one of the restrooms, but I was getting even colder standing around. We looked up toward the trail and saw two figures coming down. Delaware Dave said that one of them looked like the Abominable Snowman! He was right. The figures made their way down the switchbacks and headed towards us. I realized that the Abominable Snowman was Abbi (Otherworld)! “Is that Wendy?” she asked. It was so nice to see a nice, familiar face, especially in these conditions! Thoughts of getting off the mountain and getting into town where they could warm and dry kept Otherworld and Luckyman happy. They both had good attitudes. Craig realized that he had left his phone in the car of the people who had given him and Delaware Dave a ride up the mountain. Luckily, Delaware Dave had their number and was able to let them know. They said they would turn right around and come back up the mountain to deliver his phone back to them! Otherworld really wanted to go to Bishop and asked me if I wanted to go with her. Since it was 40 miles from the trail and I had already been there, I really did not want to go back there. The thought of getting warm and dry was appealing, however. She went into the outhouse and changed out of her clear plastic rain outfit and into her down pants and jacket. I started to think it might be nice to go back to town with her, but hoped we could stay in Independence. The car returned with Craig’s phone and he asked the couple if they could take Otherworld, Luckyman, and myself into town. “Of course!”. So we loaded our packs into the back and got into the backseat. 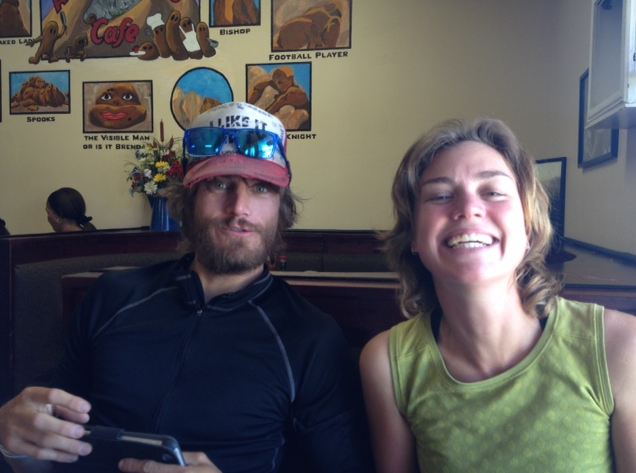 It turns out that this couple, who lives 70 miles from Death Valley, spends their wedding anniversary in the Sierras every year just so they can help shuttle us PCT hikers around! Amazing! Otherworld asked if there was any chance they could drive us to Bishop and the man said that would be up to the boss. His wife agreed and we were soon speeding down the highway. My sleeping pad was flapping around in the wind and the driver pulled over to make sure it was secure. Once back in the car, they commented on how we all got quiet all of a sudden and saw that we were all transfixed on our phones. They said we were just like their grandchildren! We offered to buy the couple dinner, but they declined. They dropped us off and we said our goodbyes, and then Otherworld went to find us a room in a motel that she had visited often on family vacations. Unfortunately, they were all booked up, so we headed back to the Rodeway. Seeking and Razor were still there in the same room! They were planning on having sushi again, so we joined them. Luckyman had an equally hard time with Razor. When he went to the restroom, Luckyman said, “Now I know why they call him Razor. Because he cuts through everyone’s conversations!”. We headed back to the room and Otherworld went outside to call her boyfriend. I barely unpacked my things since I didn’t need to do any sorting here. She ended up talking to Razor and Seeking outside the room for awhile and also ended up getting frustrated that she wasn’t given the chance to answer the questions she was being asked. After she came back in, I finally fell asleep. 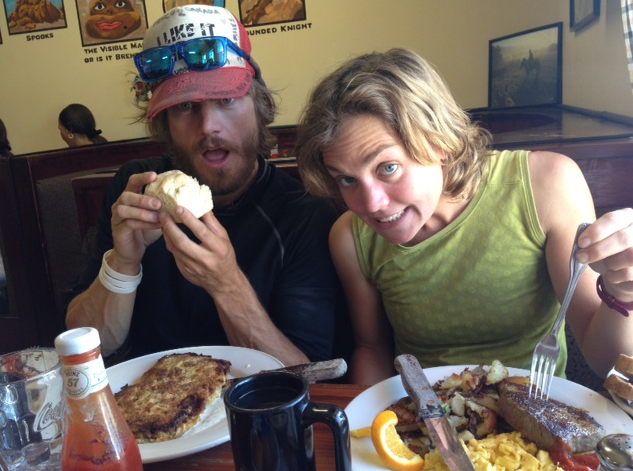 This entry was posted in Uncategorized and tagged Lone Pine, Onion Valley, Pacific Crest Trail, PCT 2013 blog, PCT thru-hike by Wendy. Bookmark the permalink.